In August 2017, this floor-bound sculpture - a shallow wood basin spread with sand and the artist’s signature matte pigment - was damaged while on view at The Centre for Fine Arts (Bozar) in Brussels. 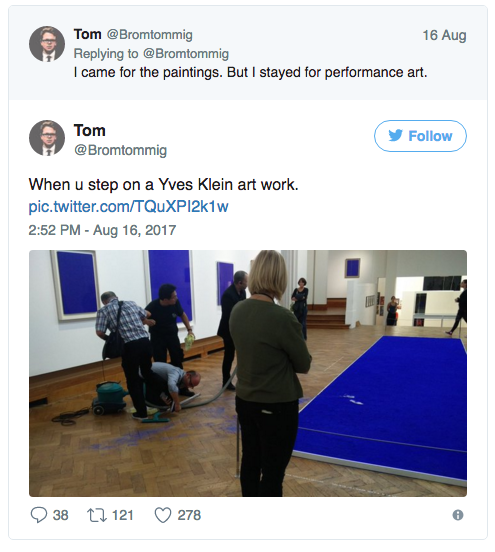 A museum visitor, approaching a different work, inadvertently stepped on the piece, leaving white footprints and a trail of blue dust on the museum floor. “Even though we have several safety measures (warning signs, a partial barrier and a guard), the man was too fascinated [with the other work] to notice all of that,” a museum spokeswoman said. Fortunately for all involved, the work uses new pigment and sand every time it is displayed; museum staff were able to restore the work in-situ and reopened the exhibition shortly thereafter. ‘It’s not the same as damage to a “unique piece”,’ the spokeswoman explained.